But the castle’s not just an artist’s dream. Dunnottar (from the Scots Gaelic Dun Fhoithear, meaning “fort on the falling slope”) has played a central role in some pivotal moments of Scottish history. Dunnottar was besieged William Wallace (as immortalised in Braveheart); was once guardian of the crown jewels of Scotland; and has been enmired in the battles between English and the Scottish people. Dunnottar has an incredible combination of good looks and historical importance – and frequently blows away visitors travelling to Scotland on vacation. The spectacular setting of Dunnottar Castle. You’ll encounter Dunnottar Castle around 20km south of Aberdeen – on the savage Scottish coast adjacent to the town of Stonehaven. 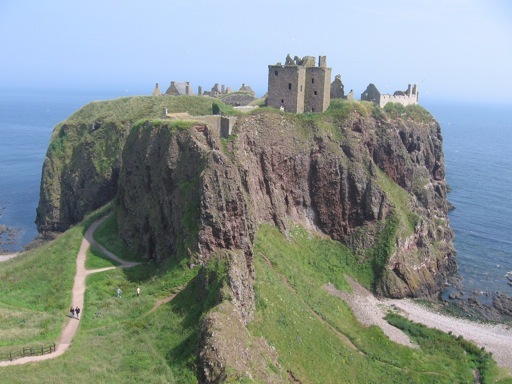 The castle is situated on a dramatic thrust of rock which has bulges out from the Stonehaven shoreline. This flat-topped, red sandstone island is surrounded by the choppy North Sea; and was once connected to the mainland by a natural causeway – the Fiddlehead. This aerial view of Dunnottar Castle shows its phenomenal position in the North Sea. Credit: Roger Wollstadt, Creative Commons (CC-BY-SA 2.0). However, to protect the Medieval castle from attack, the natural pathway across the Fiddlehead was deliberately hacked away. Instead, a new access route was cut into the cliffs. This plunging, narrow entrance route was designed to be a nightmare for any would-be attacker. This is because of its twisting pathway, blind corners, and arrow-looped 26ft tunnel – which would have made it easy for archers to pick off incoming assailants. An internal tunnel, burrowing through the rocks beneath Dunnottar Castle. But if an attacker could make it to the castle gatehouse, they’d have been amazed at what lay behind. Behind the ‘bottleneck’ of Dunnottar’s entrance, the castle stands on a flat-topped rock which measures more than four acres in size. Whereas other castles had to cram in smaller buildings to fit behind their expensively-built curtain wall, Dunnottar has the luxury of being able to spread itself across the top of this magnificent rock – naturally defended on all sides by the lashing ocean. This allowed the castle’s owners spread themselves across the cliff – indulging any desire in large and luxurious living quarters. This even included a palace fit for a King – more on this below. Dunnottar Castle has played a role in numerous important moments of Scottish history. One of its grislier moments came during the Wars of Scottish Independence. Fearsome Edward I, King of England from 1272-1307, is commonly known by his nickname of “Hammer of the Scots”. After a successful conquest of Wales, Edward set his sights on capturing Scotland and consolidating his hold upon the British Isles. The ruins of Dunnottar Castle, and the steep cliffs which lie beside them. Scotland, however, proved a hard nut to crack. Although Edward I seized the opportunity to exploit a power vacuum in the country, and famously sacked the town of Berwick in 1296, his victories stirred up nationalist resistance – lead by the charismatic William Wallace. In 1297, William Wallace lead the Scottish rebellion against the English invasion, and besieged Dunnottar Castle – presently held by English troops. Terrified by the progress of Wallace’s troops, as many as 4,000 English soldiers holed themselves within the stone chapel inside Dunnottar Castle – naively believing that hiding out in a church would spare them from death. The choppy, violent sea surrounding Dunnottar Castle. They were, unfortunately, to meet a grisly end. Wallace’s army ransacked the castle and torched the church, burning alive those within. Some, of course, managed to flee – but their only choice was to leap off the steep cliffs into the thrashing sea. We should take the words of Blind Harry with a pinch of salt – he wrote his poem more than a hundred years after William Wallace died! However, it’s this work of literature which created the legend of William Wallace – and fuelled the movie Braveheart, which I’ve no doubt you’ve already seen. Let me tell you a story of another of the most important moments in Dunnottar’s history: it happened a long time ago, back in 1651. In the 1650s, Dunnottar Castle was thought to be the most secure spot in the whole of Scotland. As a result, it was the perfect place to guard the Scottish crown jewels – protecting them from the advancing English army of Oliver Cromwell. A modern chair, bearing the name of Dunnottar Castle, within the castle. All the treasures of Scotland were held in the castle – including the full Scottish Regalia, which encompasses the ceremonial crown, sceptre, and sword of state (you can see all these items on the modern Scottish coat of arms). However, in 1651, Cromwell’s army, lead by General Overton, laid siege to the castle. With just 69 men inside the castle, and a puny 42 guns, their chances of holding out against the English onslaught were pretty hopeless. It would have been a terrible blow for national pride if the Scottish Crown Jewels had fallen into the hands of the English. Because of this, Reverend Grainger of nearby Kineff parish concocted a daring plan. His wife Christine was a close friend of the wife of Governor Ogilvy – the commander in charge of the siege inside the castle. Christine Granger was heavily pregnant, and rode up to the English troops bombarding the castle. She appealed to the better nature of the English commander, General Overton, saying that English gentleman should naturally spare women from war. To that end, she’d like to visit her close friend inside the castle for moral support. The ruins of Dunnottar, which you can explore upon the island. General Overton was too kind. He let Christine Granger pass into the besieged castle. When inside, she proceeded to wrap the Scottish crown in her skirts, and conceal the orb and sceptre in her distaff (a tool used for spinning wool). She then smuggled all the items from the castle back to her husband’s parish. They buried the crown jewels deep beneath the pulpit of their church for safe-keeping. It was only some ten years later, during King Charles’ Restoration, when the jewels of Scotland were finally unearthed. A plan of Dunnottar Castle. Adapted from original by Jonathan Oldenbuck, Wikimedia Commons. A – Entrance/Benholm’s Lodge. B – Tunnels. C – Towerhouse. D – The Old Forge. E – The Old Lodge. F – The Stables. G – The Modern Palace .H – Church. I – Postern Gate (for sea-access). K – Palace Bowling Green. L – Sentry Box. Nowadays, Dunnottar Castle is almost entirely ruinous. The castle suffered badly during Oliver Cromwell’s bombardment, and it took until 1925 for any preservation work to begin. Considering the castle’s position alongside the beating sea, and battered by howling winds, its no surprise that time hasn’t been particularly kind to the remaining stones. Almost all of the site today is ruined – you’ll find yourself wandering around evocative remains, which can be tricky to visualise as once was. A model of Dunnottar Castle, demonstrating what it likely looked like during the Medieval period. 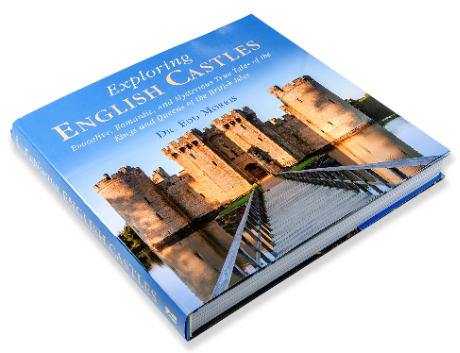 One of the most interesting ruins is the c14th Tower House – quite literally a little castle inside a castle. The Tower House tradition was unique to Scotland, and represented a cross between a noble mansion, and a fortified residence. This particular example would once have extended to three storeys high, with an ornate, separate chamber for the Lord. The Tower House was an excellent example of luxurious accommodation being added to a medieval fortress. However, the Tower House was trumped by the construction of the polygonal Palace, at the brink of the headland. The Palace would have been built in the early c17th – a phenomenal accommodation designed to maximise the dramatic views across the neighbouring coast. Designed in the ‘English style’, the Palace was filled with large kitchens, a bakehouse and brewery. A shield detail, found in the ruins of Dunnottar Castle, visibly dated to 1649. The Palace’s accommodation enjoyed the ultimate accolade – it was literally fit for a king. Charles II lodged in the King’s Bedroom in the mid 1600s. Dunnottar Castle is presently held in private hands, but the entrance cost is a true bargain: about a third of the price of visiting Edinburgh Castle, and debatably more interesting, to boot. The ruins are windswept and beautifully evocative – ripe for exploring. Half of a day is a generous amount of time to explore Dunnottar Castle, and if you’re feeling ambitious, there are walks on the neighbouring shoreline to Stonehaven (it’s almost certain to rain and be windswept, so don’t be surprised if the heavens open on you). Although it’s not impossible to reach the castle by public transport, it’ll be a challenge, and your best part is to drive to the castle. It’s barely 20km from Aberdeen. If you’re looking for accommodation, lodging in Aberdeen is evidentially your best bet. A good bet for a stay in Aberdeen is the Atholl Hotel, which is consistently praised on TripAdvisor. (Affiliate link through TripAdvisor). It’s a medium sized place with 34 bedrooms – small enough to provide very personal service, but big enough to have your own space. If you’re interested in exploring other interesting castles in Scotland, why not discover the distinctive triangular shape of Caerlaverock Castle, which is nestled closer to the border of England.